Description - Our tight-lock rubber tiles are the definitive choice for everyone from the home user to the large scale commercial user who desires the easiest to install rubber flooring solution on the market today. The option of ordering corner, border, and center tiles makes virtually any size area easy to cover without having to custom cut the tiles into place. These tiles are water jet cut to ensure the tightest fitting rubber tiles possible. They fit together so well they appear virtually seamless unlike the many die cut tile options available. These tiles are safe to use both indoors and out and can be loose laid so no adhesive is required. Material – Recycled rubber buffings and colored EPDM virgin rubber flecks. Rubber buffings are the “Filet Mignon” of the recycled rubber industry since they are the cleanest, strongest, and most consistent raw material as compared to some of the less expensive recycled crumb rubber alternatives available. Recommended Uses – Has been used successfully in weight rooms, commercial gyms, home gym and exercise rooms, athletic arenas, doggie day care and pet grooming facilities, locker rooms, ice skating rinks, baseball dug outs, golf course locker rooms, Kids play rooms, basement floors, over radiant heated floors, bathrooms, on boats, on outdoor decks and patios, areas where slip protection is required, areas where sound proofing is required, under fitness equipment, Kitchens, hallways, utility rooms, storage sheds, as anti-fatigue flooring where long periods of standing occur, retail settings, where temporary runway flooring is needed, television and movie studios, etc. Water-jet cut for seamless appearance. Available in corner, borders and centers. What are the dimensions of the border tiles? Approx width and length? All of our Tight-Loc Tiles are 3' x 3' in size. What are corner tiles, border tiles and center tiles? Our 3/8" Tight-Lock Tiles are just like the pieces of a jigsaw puzzle, so just like a puzzle, our tiles also come in corner, border and center pieces. Corner tiles are designed to be used in the corner of your floor, with 2 flat edges to go right up against your wall. Border tiles go along the border of the floor and have 1 flat edge for the side that touches the wall. Center tiles are used in the center of the floor, and have interlocking edges all the way around with no flat edges. Can this be used in a garage and what impact will a vehicle have on it? 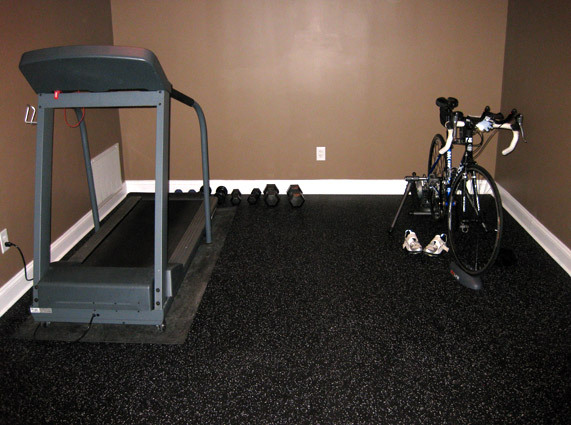 Our 3/8" Tight-Lock Rubber Tiles can be installed in a garage and a car would not destroy the tiles. There are two things that may happen with these tiles when installed in a garage. If your car is leaking oil, there is potential for the oil to break down the tiles over time. If that is the case, we would recommend placing one of our Nitro rolls where you park your vehicle. The second issue that might occur, is when you are driving into your garage, if you turn hard, you may cause the tiles to separate. The only way to prevent this is to glue the tiles. Do you ship to Canada, if so are there added costs? We do ship our 3/8" Tight-Lock Tiles to Canada. To get a shipping rate for orders shipping to Canada, please contact our Flooring Heroes via chat, phone or email. I'm thinking of using this product in my painting studio. Are the tiles leak proof? If I spill paint or solvent on this floor, could it seep though to the floor below? Our 3/8" Tight-Lock Tiles are somewhat porous but would not allow paint or solvent to go through the floor. The tiles do interlock very tightly, but if there is some separation, there is potential for paint or solvent to penetrate to the subfloor below. The tiles were everything I had hoped for and more. The quality is top notch, and instalation was a breeze. 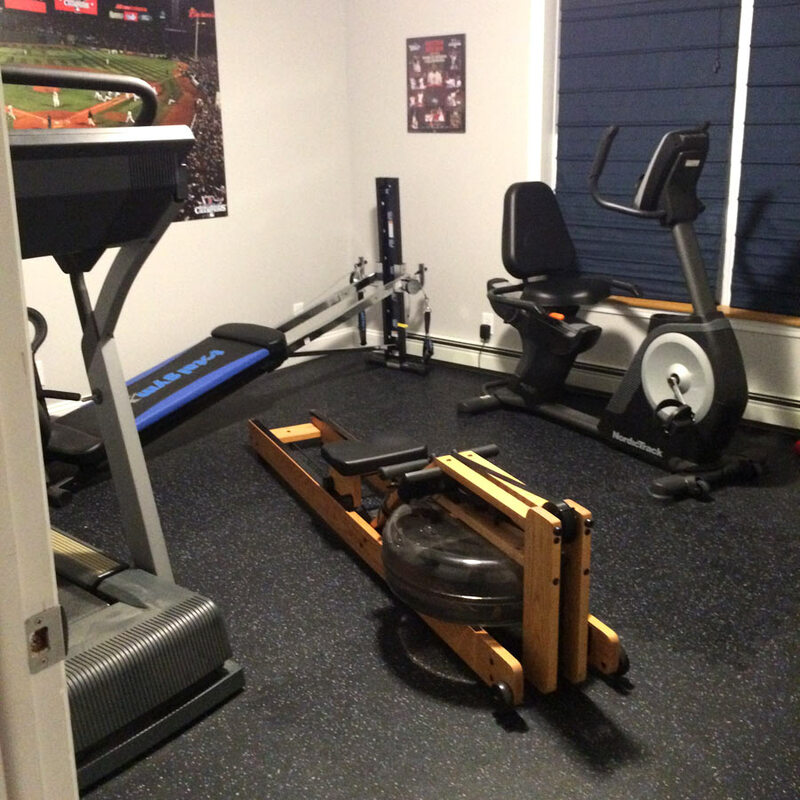 We completed our basement workout room floor last week. The hard part was moving all of our stuff, but the floor was easy to install and really looks great. Very Professional. We actually installed the slate pattern tiles on 1/3 of the room the week before. That is an area that I do Zumba Fitness on. The slate has enough slide ability to be easy on the knees for dancing. That floor was also very easy and fun to install. 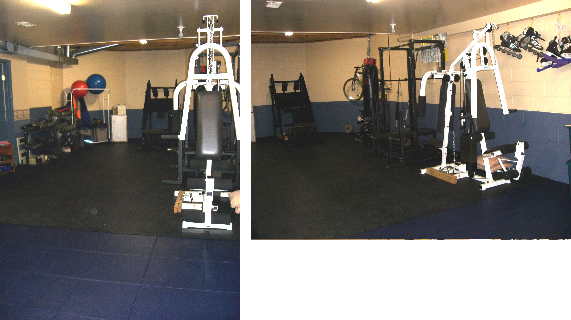 Then the next week we installed the rubber floor on the rest of the workout room. We now have a great gym. I highly recommend the products that we used and the service was wonderful. I was happy to get the samples so quickly, that made my decision on color very simple. Great products, great results!!! Thank you, RubberFlooring. This flooring is awesome! 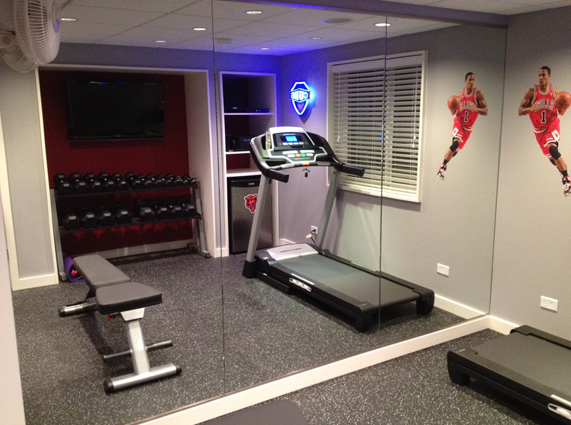 I installed it downstairs in our home gym. The interlocking parts go together perfectly so that they almost become invisible. It's easy to cut with a sharp utility knife - just make sure you have something underneath (like a scrap piece of wood or a scrap piece of this rubber flooring) for when the knife goes through. I found it easiest to do the first cut with a straight edge. Then take away the straight edge, bend one side of the tile down to expose the cut line, and then make multiple passes with the knife. After each pass with the knife, the cut opening will get bigger and bigger, making it easier and easier to cut.